I have been wanting to go to the Great Dickens Fair in San Francisco for at least have of my life and this year I took the plunge and went today, Sunday November 27, 2011 with a friend of mine. This is just some highlights and not every detail. I apologize that the photos are pretty ‘ghostly’ with the dark environments being hard to capture on my camera. I will posting more photos on my FLICKR page later this week. I started off taking BART to the Glen Park station and took the FREE shuttle to the Cow Palace in South San Francisco. The fair starts at 11 am and the first shuttle did not arrive till 11:15 am, but the trip takes about 10 minuets and we had per-bought are ticket and were able to get in fairly fast. You enter the Cow Palace through a switchback and find your self on a ‘movie set’ with false front buildings filling the space to create Victorian London. At first it seems odd as you enter a world of perpetual ‘twilight’, but that helps mentally to help hide the limits of a show like buildings with no roofs. Here the characters from Charles Dickens’ books wander the streets with the people of London on Christmas Eve and go about their business whether they have an audience or not. I did not wear a costume per-say, but tried to be in spirit at least with a dress shirt, vest and cap. I think it is a good way to feel part of the fair’s story if you can accommodate it. When I was younger they actually gave away a poster that had tips on simple costumes for guests to wear. I have not seen that for a long while, but I bet you can find something online to give you some ideas. Our first stop was to the Victoria and Albert theater to see a classic Christmas Pantomime ‘Cinderella and Aladdin meet the Monkey King’ with a mixture of music hall spirit in a family friendly production. Here fairy tale characters are mixed together with all rules thrown out and some men are played by women and some women are played by men. There is a happy ending followed by sing-alongs and slap stick fun. 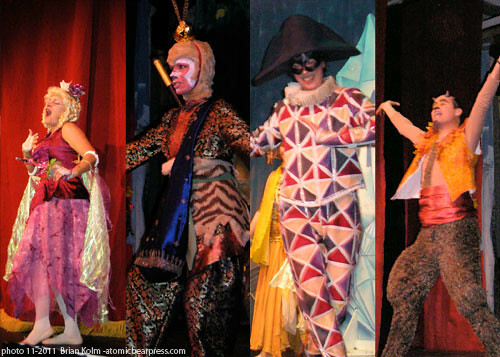 Next time I would like to also catch their production of Gilbert and Sullivan’s ‘Mikado’ that plays once a day. Next we headed to food and I tried Haggis for the first time and maybe the last. It actually tasted good, but there are other things I prefer. I also had some Chocolate EggNog that was really really tasty. While sitting down to eat we found a flyer for a life drawing art salon and 3:30 pm at the Adventures Club and we both agreed we wanted to go. We learned how to play the harp and wandered the streets looking into specialty stores. 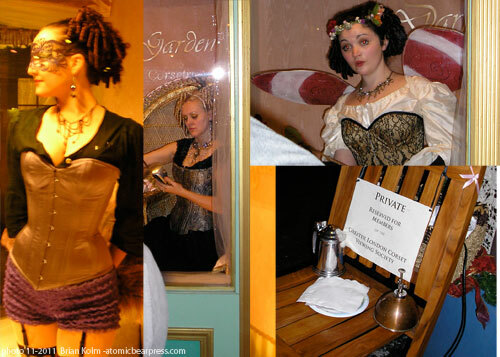 San Francisco’s Dark Garden had a store front selling period corsets and had live ‘manikins’ in the windows. The store always had a male heavy crowd gaping at the lovely girls in the windows and I noticed that there were service men in dress uniforms that seemed to always be there gazing as we passed by, but as a guy I can see why. A procession of carolers passed by with Father Christmas in tow shouting ‘Happy Christmas’ and the temperance society stopped to tell me about their cause and at the nearby Adventures Club some officers were having some naughty fun with some lovely ladies till they fled their revelry when a high ranking general confronted them. 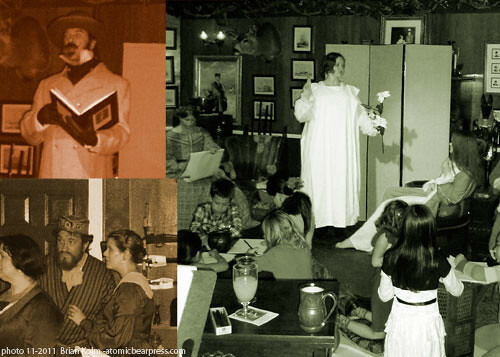 The adventures club was an area that I would have liked to have experienced more with lots of tableaux and presentations throughout the day. For example, near the end of the day we found Prince Albert presenting a model of the Crystal Palace for the Great Exhibition of 1851. On a friend recommendation who was working one of the booths we tried the Hard Black Cherry Cider which was really good and really relaxes you and puts you in a holiday spirit. There was a royal precision of Queen Victoria and her husband Albert that marched by on their way to Fezziwig’s Dance Party. Next time I would like to learn some of the period dances as well, the dancers were still going at closing time with a large crowd. Along the way we stopped by the steam-punk inspired La Legion Fantastique, but sadly seemed to miss most of their presentations. 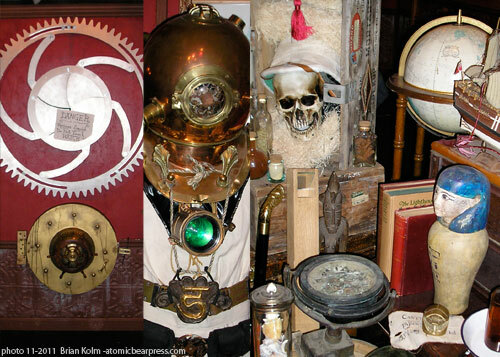 Next time I would make an effort to see some of them from a steam powered robot to giant squid feeding. Another thing is to keep an eye open for characters like Scrooge walking with the Ghost of Christmas Future as the stories of Charles Dickens play out thorough out the day. After doing some shopping we headed back for the Artist Salon at the Adventures Club where they provided paper and pencils to draw from costumed models while live music is played and poetry is read. I would have loved for them to have their own space and have events going all day cause it was lots of fun and the models were very good. The life drawing session was at 3:30 pm if you are going, but be early enough to get a good seat. As we got closer to the end of the day we sat down for some dinner where I had Yorkshire Pudding which was tasty, but I should have purchased a side dish to go with it. I also got some rich roasted chestnuts. While a few of the food items at the fair can be pricy, they are mostly all unique items and at full range of different prices. If you are worried about diet or on a budget, I would make sure to eat a hearty breakfast/brunch before coming and then enjoy the special food/treats knowing that you had something substantial before coming. Next time I want to get one of the small meat pies run that about $6.50 and looked really good. 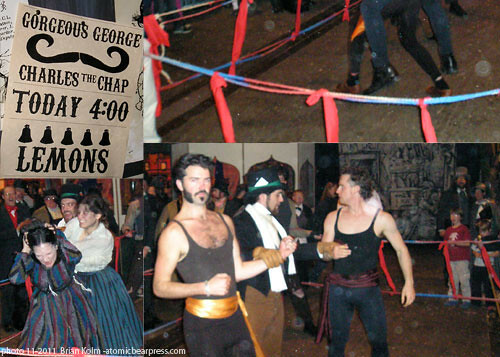 While my friend shopped I headed back to the La Legion Fantastique and found an impromptu boxing match in progress first with street ladies and then with Gorgeous George vs Charles the Chap who had posters announcing the fight throughout the streets. I was impressed that they had gone to the detail of the posters announcing the fight. At the Legion Fantastique I chatted with Professor Phineas J. Flockmocker III F.H.S.C about his new discovery: electricity (he claims it might catch on some day a little) and his plans to harpoon his way to the moon. The gent was really in character and was surrounded with props to help tell his story. Definitely worth a visit. As we neared the end of the fair’s day (the events run till 7:00 pm with the last shuttle at 7:15 pm) we headed to the 6 pm performance of Mad Sal’s Music Hall Extravaganza (featuring the Le Can Can Bijou) which featured all the performers from that day coming together for a bit naughty, raunchy fun. The most adult material in the show was sexual innuendo and lyrics about booze. The other big night time show was the 18 and over only Saucy French Postcard Tableaux Review at the Albert and Victoria Music Hall, but you have to get a FREE ticket to get in due to popularity. Tickets were gone when we check, so go early in the day to get one if you want to see it. The show runs about 50 min which gave us enough time to stroll to the exit and catch the shuttle back to the BART station. Note: the last shuttle is 7:15 pm by-the-way. Heck ya. It really was a great way to celebrate the holidays and it feels very organic and alive. The tickets run $25 per-person (unless you have a 2-for-1 coupon to use at the door or buy your ticket early) but you really get your money’s worth with just the entertainment alone. There were so many events/productions that I would have loved to have seen that I would think of trying to get discount tickets early next year and even planning to go more than once. We went on a Sunday and the crowds were never to crazy, so if you don’t like crowds that might be helpful since they say they get more busy as we get near to Christmas. The biggest cost beyond your entrance ticket is transportation and food and drink, but if you are on a budget you can still do a lot with some careful planning. I definitely plan to go back next year and maybe even with more of a costume. – If you want to see the Saucy French Postcard Tableaux Review, make sure to get a ticket early in the day (tickets are free, ages 18+), if you can’t, don’t worry and go to Mad Sal’s. – Eat a hearty, nutritious meal before you come and then explore some of the unique food and treats at the fair with out fear. – Interact with the characters and be part of the story. Feel free to pretend you are from the Victorian era yourself. – Get there early in the day to get your moneys worth and avoid the crowds. – Dress the part, even if it’s just a hint of Victorian London to make you feel part of the story. 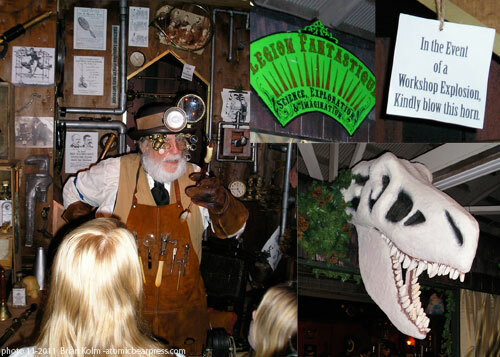 – The Adventures Club hosted an artist salon with costume models which was a blast. 3:30pm this year when I went. – Be open to follow your ‘bliss’ and to not feel guilty missing something cause there is a lot going on. – Use this as a chance to recharge your adventurist spirit and get ready for the holidays and don’t forget to try something new. – Sunday early in their season might be a great day to go. Really nice review! Well said and thorough. You mentioned learning how to do the dances. WELL, most of the “Set” Dances are taught just before they’re done and as for the waltzing and polkaing, there are a number of events around the Bay. Although we’re normally Steampunk and Electro-Swing themed, we’re going to have a waltz and polka primer taught by the man who plays The Prince himself on the evening of December 8th! Details are being finalized now and will be published to our website shortly. We also encourage those interested in these sorts of things to check join our Facebook Group. The first two weekends are always less crowded than the last two. Bay area CVS stores have advertisement cards that also function as discount tickets. Great review. But you know the food venues would appreciate that you do not discourage people from trying different foods. I have a problem with the food, because it is mostly meat based,- or dairy and eggs, and for a vegan, there is very little to eat, maybe the veg. pasties. You didn’t see our Chestnut Cart, next to the bangers, and the french onion soup, $4.00 for a cone, and it is a meal, all you may need is a salad. The children’s area is a delight, and did you see the Merry go round with beautiful hand crafted animals (African Safari) done by the booth owner himself! You need to come a couple more times to really catch all the shows and see all the booths, and how about the games and gaming. There is besides the regular photo booth and naughty photo booth! Anyway the show is perfect for children and for adults. Please come back this year! Thanks for the feedback Jonah. I hope to make it back next year a few times to catch a lot more and maybe even with some costume. I did enjoy the food quite a bit and I did not realize what I had written had come across as discouraging. I did go in and re-worded it to hopefully sound less so while still trying to get across what I was saying. I did not even mention the Chocolate Fudge with Nuts I got and could not finish since it was so big and rich and tasty. Fabulous review! Got a season pass and I intend to use it to the fullest! 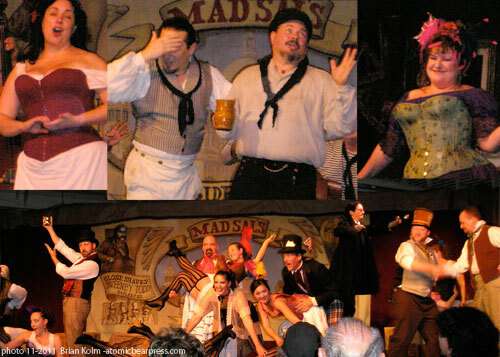 A note about Mad Sal’s – the Music Hall Extravaganza is loads of fun, but a bit disjointed simply because the individual acts are so beautifully put together. I would reccommend seeing the Broadside Review at 4pm if you’re going to go to the French Postcards show (sadly scheduled at the same time as the Extravaganza). Also, the acts get raunchier and raunchier and raunchier as the days go by. Just remember NOT TO BRING YOUR CHILDREN. Because believe me, the first few nights are relatively tame! If you do bring your children, have them stop by the Punch and Judy show – for a 300 year old puppet show, it’s considerably fresh and always delightful! Otherwise stop with them in front of Mad Sal’s – the local peasants and gamblers are great with kids, and children seem to love learning how to gamble (nothing too insidious, I promise). It was surprisingly cute for such a seedy part of town! As for food, the meat pies are grand. There is always Cuthbert’s Tea Shoppe for a nice sit down, and if you’re hurrying, stop by Mr. Brown’s for some amazing chai tea – freshly made, too! If you’re wanting some adult beverages, I’d recommend the Green Man Inn, or (for something a little more interesting) the Bohemian Absinthe Bar. I was pretty surprised – it was all amazing! Haven’t seen you in a while since WonderCon I think. Great review of the fair. I started about 5 years ago and have ended up going multiple times per year since there is just so much stuff. They have a season pass that is reasonable if you are going to go more than twice. There is also a nice schedule of events online but a lot of the other things become impromptu, such as the characters performing scenes from the books as well as the boxing match you mentioned. Some folks have even gone as other characters: The Phantom of the Opera, The Doctor from Doctor Who, even Baron Von Munchhausen. Lots of possibilities if you don’t have a period costume. 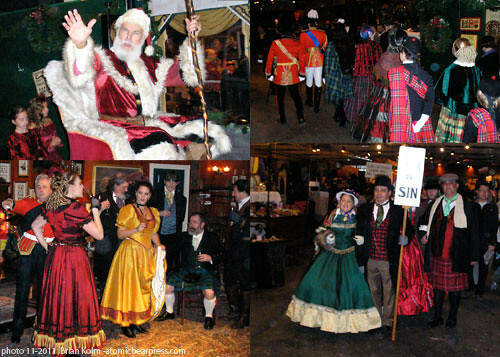 I have plan to go dickens fair with my children by Bart. Where is the shuttle bus stop around Glenpark station. I’m first comer in San francisco, so everything is strange! One more thing, is it available to get the bus with stroller? Previously Thank you for your answer! The BART stop is at the side of the station going up-hill. As you leave the station, make a left turn. There will be a decorated A frame sign.